My mom tells me that in her high school English class, during a discussion of how, grammatically, certain words should be modified (i.e. is it "narrower" or "more narrow", "certainer or more certain"?) the word "perfect" came up. Some students thought "more perfect" the correct usage. others thought "perfecter" was acceptable, if somewhat clunky. My mom pointed out that it was neither. Perfect, is, by definition, without the possibility of improvement, and so there was no need to modify the word. You could not be more perfect than perfect. And her teacher agreed. But Wednesday night, Armando Galarraga taught us what my mom and her high school English teacher could not: You can improve upon perfection after all. As you by now know, the Tigers' 28-year old Venezuelan pitcher retired 26 consecutive Cleveland Indians that night in Detroit, and then disaster struck. Well, not disaster, exactly, but certainly an injustice. Galaragga induced a little grounder to the right side of the infield, which was cleanly fielded by Tigers' firstbaseman Miguel Cabrera, who threw to Galaragga, covering the bag, as the pitcher should. It was the ideal, textbook ending for a gem of a game, 83 pitches of remarkable efficiency and effectiveness, leaving the pitcher holding the ball with which he had entered the record books. The now infamous umpire, Jim Joyce, despite having a clear view of the play and plenty of time to call it, somehow called it wrong, making an out batter safe and a perfect pitcher flawed. Replays showed that Joyce was clearly in the wrong. Galaragga has the ball in his glove and his foot on the bag while Donald's foot is still perhaps 12 to 18 inches from touching the bag. Granted, that's just a fraction of a second, but this is what umpires train for, hone their skills for a quarter of a century for, and this is what they're paid to do. He's got to get that call right, especially now. Normally, as I understand it, an umpire makes that call with both sight and sound, watching the base for each player's feet while listening to hear the ball hit the fielder's glove. If you watch the replay (and I know you have, lots and lots of times already) you see that Galaragga didn't catch the ball right in the meaty part of his hand, which would make the loudest 'pop'. The fact that Miguel Cabrera only had to throw the ball about 15 feet means it wasn't thrown that hard, and the fact that Galaragga caught it in the webbing, as you're supposed to, and that it rattled around a little only makes it tougher. It didn't rattle much. He essentially had control of it, but it was enough to dull the sound and perhaps make it difficult for Joyce to hear it. To his credit, Joyce doesn't cite this as the problem. He just admits to screwing it up and asks for forgiveness, something Galaragga has already given him, even if the Detroit Tigers' fans never will. Umpires make that call all the time. Joyce makes that call all the time and has never previously been challenged like this, because if he's ever been wrong about it before, it was never in so momentous a spot. Never with 18,000 fans watching in rapt attention, waiting to be able to tell their grandchildren that they Witnessed History. But he blew it. An umpire's mistake accomplished what 27 Indians' intentional actions couldn't, and just like that, history was, well...made anyway. It's been said frequently that Galaragga's "failure" to accomplish the feat will actually make him, and this game, more famous than if he'd actually done it. That may be true. After all, Kenny Rogers, Len Barker and Mike Witt all had careers that belied their one-time perfection, making that hardly the first thing you think of when someone brings one of their names into the conversation. Galaragga likely would have fallen into the same category. Now he's in a class by himself. No, commissioner Bud Selig can't - or at least won't - overturn Joyce's call. He could. He's got the authority, both from his title and from the "best interests of the game" clause in his contract, that is too frequently interpreted as "the best interests of the owners' bank accounts". But make no mistake: Selig could call the now ruined game "perfect" and it would be recorded as such in the record books. He's done it before. Randy Johnson once struck out 20 batters in nine innings, but was told that his game wouldn't be remembered along with those of Kerry Wood and Roger Clemens, because the game went 11 innings, and he left after nine. But then MLB reversed its decision and eventually decided to recognize it as an official 20-strikeout game. Others have done it before. The judges and committees at the 2002 Winter Olympics made a similar wrong "right" when they awarded gold medals to two sets of skaters. One of the judges had been coerced into modifying her scores to favor the Russians over the Canadians, in exchange for better votes for the French in the ice dancing competition. When this came to light, her score was discarded and the two pairs were declared tied, and both were awarded Gold Medals. Two sets of "the best" which is technically impossible, and yet, allowed. Selig could do the same. What if it came out that Joyce was paid to blow that call? I don't think he was, but if he was, wouldn't Selig be forced to succumb to pressures to reverse the call? Is it really any better to leave it this way simply because it was an honest mistake? The mistake happened, and it's been said that we can't simply ignore that Trevor Crowe batted again and made another out, but of course that's not true. Until recently, stats accumulated during games that failed to go the requisite five innings were ignored, with MLB essentially pretending that they, and the game, never happened. Selig could effectively pretend that the blown call, and Crowe's subsequent at bat, didn't happen. He doesn't even have to mutter magic words and cast a spell. He can just do his best Captain Picard impression and say "Make it so." and it will be so. Literally nobody can stop him, and there are probably a lot more people upset about the current state of affairs than would be upset by that. I don't think he should, but I don't want to hear him saying he can't. In true Seligian fashion, Bud isn't even saying that. He hasn't yet even addressed the blown call or the review of it directly, only the general idea of instant replay, and this in the midst of an admission that the umpire blew it and that Galaragga should have been given credit for perfection. To summarize, that means, "No." 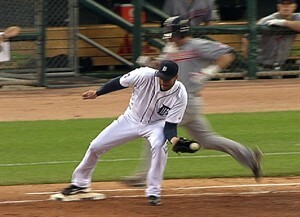 Selig won't overturn the call, in spite of the fact that this seems exactly the right thing to do. Perhaps not the correct and precise thing to do, but the good and right thing. And that's OK. The really impressive thing about this feat is that Galaragga, upon seeing that he's been robbed of his pending immortality, only smiles. He doesn't explode, or plead with the umpire or even so much as kick the dirt. He just smiles, as if to say, "OK, if that wasn't good enough, let's try this." He then goes and retires Crowe on five pitches, making him the only man in history to have to retire 28 batters to finish his perfect game. And that's exactly how he should be remembered. Galaragga's game ball and glove should go to Cooperstown, to be displayed along with the other 20 balls from the perfect games throughout history and the hundreds of no-hitters, and perhaps a photo of him smiling at Joyce when he sees the bad call. After the game, Galaragga was interviewed and showed no malice or resentment toward Joyce, ironically reminding us all that "Nobody's perfect,". And he was right about that.